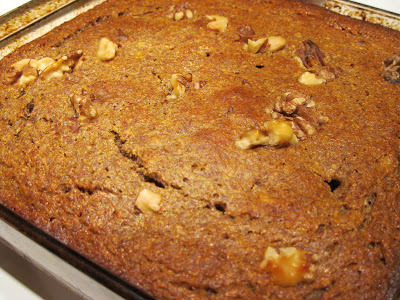 This recipe comes by way of my lovely friend Stephanie, who brought a loaf of pumpkin bread on a weekend trip to Chelan this fall. “It’s gluten-free and sweetened with honey,” she said as the boys tried it with judging eyes. “Huh, this is good…!” and from there the recipe was passed. She tweaked the original and then I added my minor substitutions as well, transforming it to banana bread not pumpkin. Steph made a fabulous looking loaf, but my pan was on the smaller side so I baked it into an 8×8″ square dish. 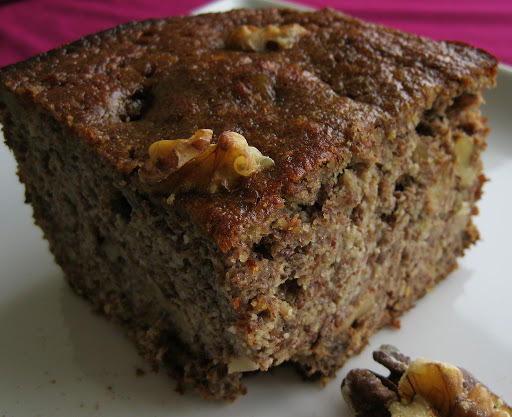 The pan alteration makes it a little more cake than quick bread, but it all tastes the same. At the end of the day, this cake is incredibly moist, almost sticky, yet strangely light and fluffy. 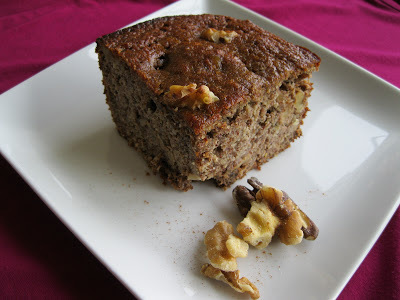 Foodie Note: This cake is not store-bought sweet, but it does have a developed flavor of earthy natural sweetness and bananas. If you want a sweeter cake, you can probably play with the proportions and add more honey and maple syrup. Preheat oven to 350*F. In a bowl, combine dry ingredients. In a separate bowl, whisk eggs, add honey, maple syrup, yogurt and vanilla. Combine wet and dry ingredients and mix well. 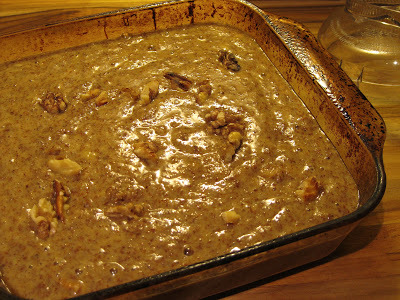 Smash walnuts by hand and fold into batter, reserving a handful for topping. Pour batter into a well greased 8″ square baking dish, sprinkle with remaining walnuts. Bake 50-55minutes on center rack in oven, until a toothpick comes out clean. Serve at room temperature with strong coffee or hot tea. If serving in the afternoon, garnish with a dollop of fresh whipped cream.